Antalya…always a place I had wanted to visit in Turkey, so I was over the moon when we planned on visiting the city as part of our trip to Cyprus. What attracted me to the city, however, I’m unsure about. Was it the well restored Kaleiçi- literally translates to “within the walls” – which is tucked within the grand castle walls and snakes its way up the hill beside the harbour? Or was it the modern, bustling vibe that you encounter when wandering along the wide streets of this modern, cosmopolitan city, housing expensive shops and large malls? The city is unusual for Turkey, as it’s located on high cliff tops. This makes for astounding views of Konyaaltı Beach, which is at the west side of the city, a bit unfortunate for those of us who like to walk. Konyaaltı Beach. Photograph by Casey Russell. 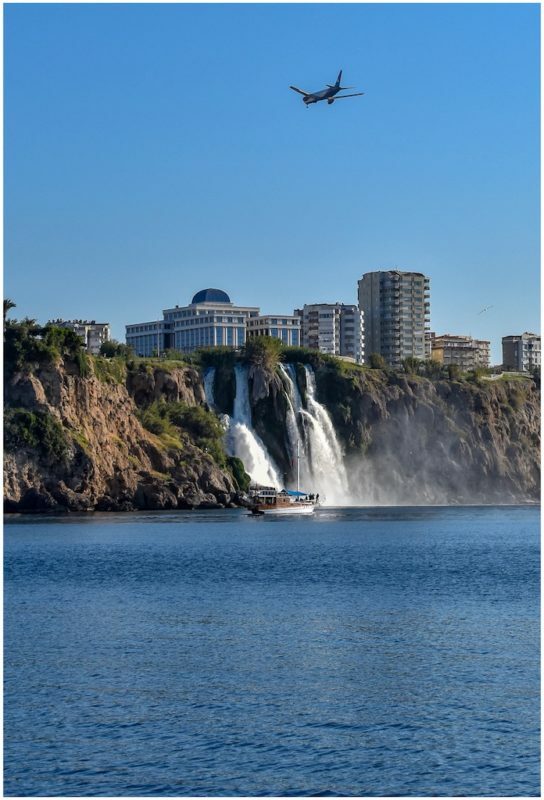 Waterfall in Antalya which is built on cliff tops. Photograph by Casey Russell. 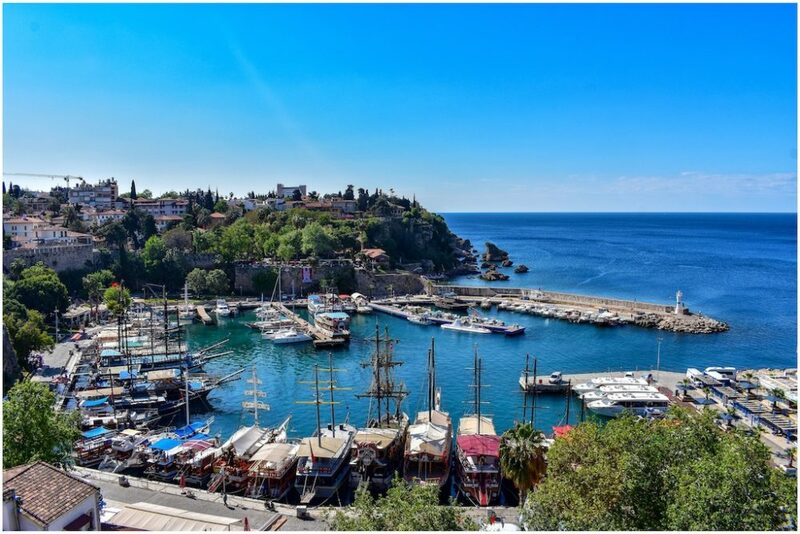 As way of compensation, the city offers buses, taxis, dolmuş and trams, which make it convenient for the first of Antalya’s attractions which you may want to visit. 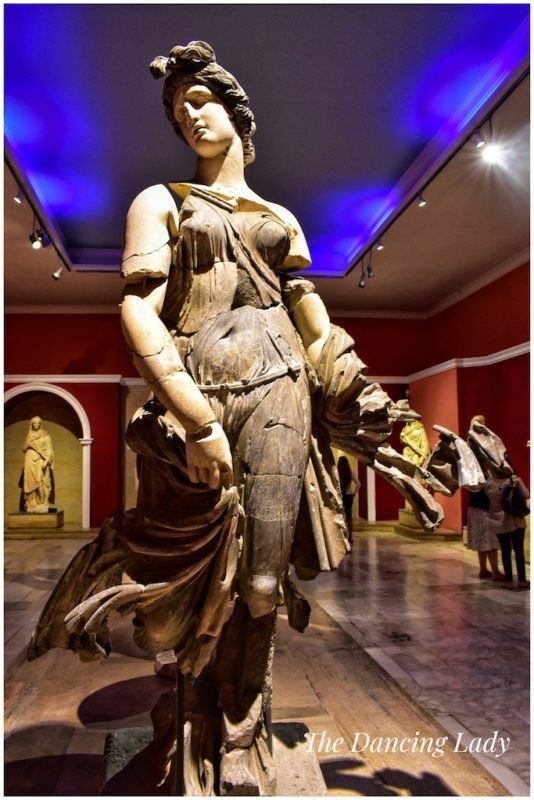 The Antalya Archeological museum is supposedly one of the best in Turkey. After visiting, I can officially clarify that this statement is true. However, when I visited, I didn’t expect much. I thought it was going to be somewhat similar to the small museum which can be found in the backstreets of Fethiye. But like I say, I was surprised. The interesting thing about the museum was that, when you expected it to stop, it didn’t. The museum was like a maze. A never ending maze to be exact. You wind your way through displays that explained history from thousands of years ago and statues that make you wonder not only why someone would want it, but also which unfortunate soul had to slave away (no pun intended) over the creation of such gargantuan statues. 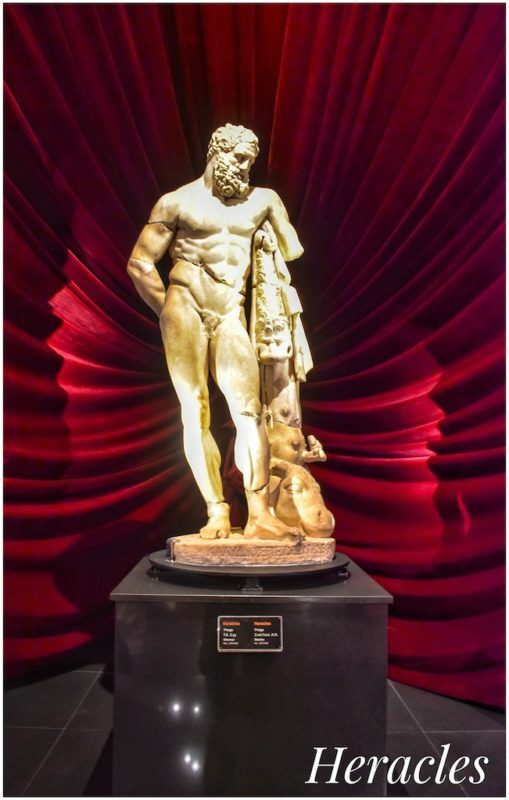 Not only does the museum exhibit statues, you can find ancients coins, the usual array of delicately restored amphora, and grand sarcophagi and tombstones. Ancient Antalya in the archeological museum. Photograph by Casey Russell. Many of the artefacts come from archeological sites that surround Antalya. The only one of which I’ve visited is Aspendos. The place does come as somewhat of a surprise when you first encounter it, as a massive great amphitheater rises spectacularly from the middle of a forest, especially when you were only looking for an old Roman bridge in the first place! Aspendos is a fascinating and eerily beautiful place, its worth the hot climb up to get the best view of the remains of the ancient aqueduct. I hear that other places such as Perge, Arkyanda, Termessos, Serge and even the coastal town of nearby Side (which is a must visit if your in the area!) are all archaeological sites which have been incredibly well-preserved, and this is only to name but a few! Whilst in the Archeological museum you are lead on a virtual tour, not only of the surrounding archeological sites, but also of Antalya itself. However, in order to experience the true historic Antalya for yourself you will have to visit the Kaleiçi, which is Antalya’s Old Town. 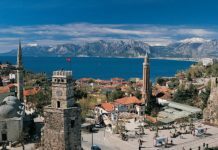 Kaleiçi is the place most people will recognise and remember when you talk to them about Antalya, it’s got to be Antalya’s busiest and most thriving district. 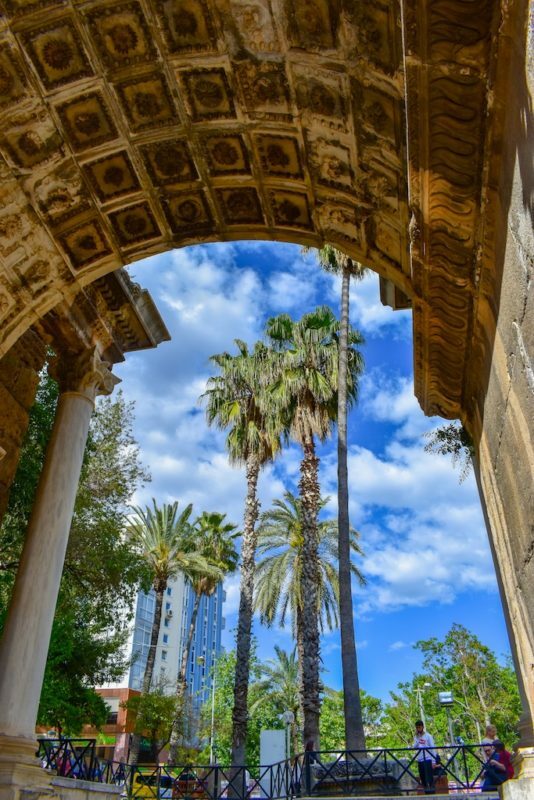 Surrounded by walls that would have once guarded a Grand Ottoman Fleet, the walls now make for a scenic walk in which you can get lost in the maze of Ottoman style buildings, and come across Roman and Seljuk ruins. The most notable of these are Hadrians Gate built around 130AD in honour of Hadrian, the famous Roman emperor, when he visited the city. 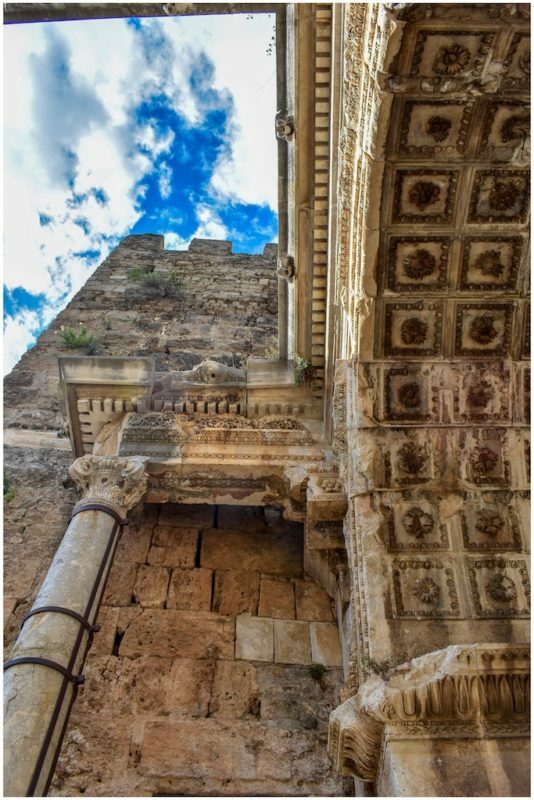 Hadrian’s Gate. Photograph by Casey Russell. The modern city from Hadrian’s Gate. Photograph by Casey Russell. 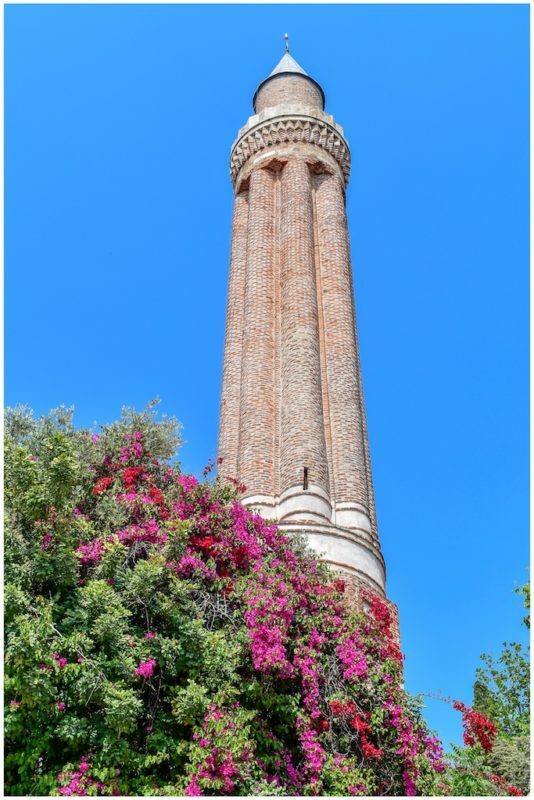 The other is the Seljuk Yivli Minare, with its most memorable fluted minaret, that has come to be known as Antalya’s symbol. This was built in 1373, and is still in use. Seljuk fluted mosque. Photograph by casey Russell. You can admire many other Seljuk mosques and Ottoman architecture by just wandering the streets. You may even find small indoor markets, and beautiful gardens. 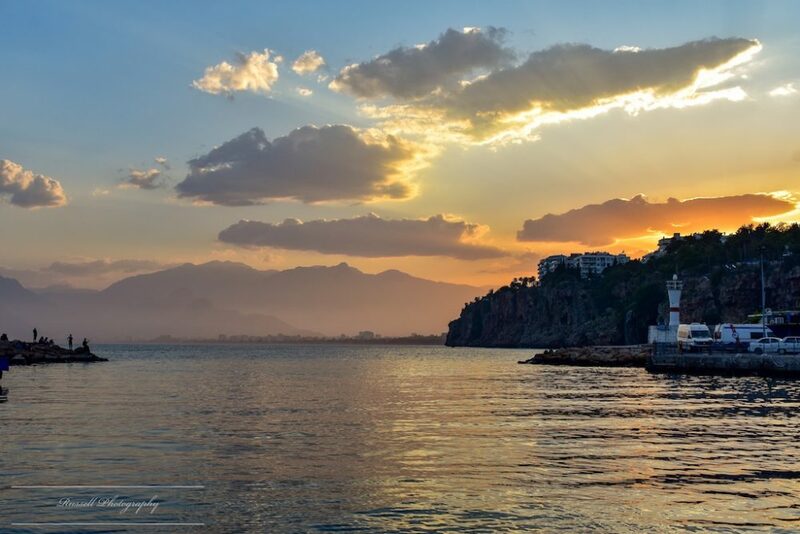 The most atmospheric place in Antalya, however, has to be the harbour. Whether it be the fisherman bringing in their catch, the gulets and tour boats fighting over who’s mooring where, or even the tourists dining on the waterfront, the harbour is a place where the fun never stops, and Turkish and international cultures meet. 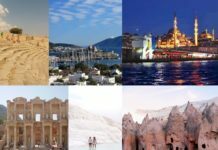 It’s a hubbub of languages and nationalities and is a great place to grab a coffee and literally watch people from all over the world sampling Turkish hospitality at its finest. Sunset from the harbour. Photograph by Casey Russell. It’s hardly historic, but you may consider dining where the late Princess of Monaco, Grace Kelly dined when she visited Antalya in the 50’s. This restaurant has a scenic view over the harbour, and I hear has a fine selection of wine. The joy comes in the hunt to find the genuine one that she went to, with several proclaiming that it was their establishment in which she dined, it’s a good excuse to tour Antalya’s fine eateries! Like most coastal towns in Turkey, there is always a Bazaar. You will find the common touristy souvenirs but, if you dig deeper and head a little off the main tourist route, you can find traditional shops selling intricate and interesting objets. 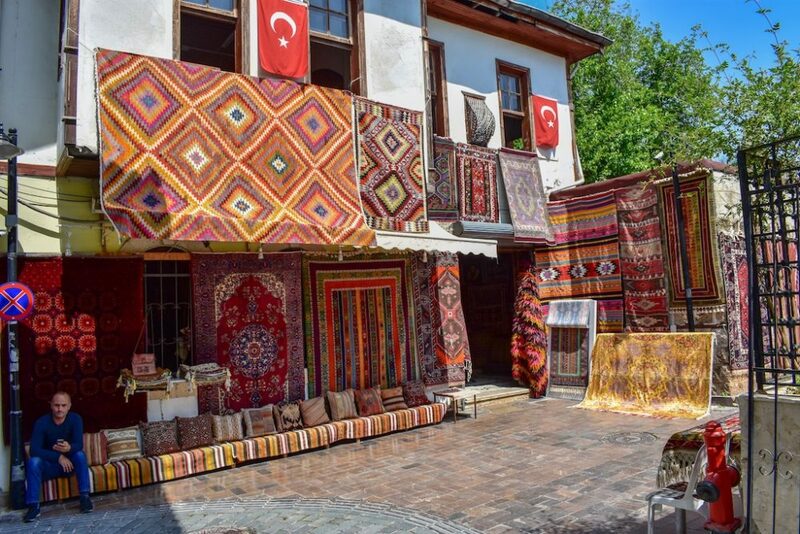 There is a plethora of carpet shops and metal works, leather crafters and oil merchants whose owners are friendly, helpful and welcoming, which is the typical Turkish way. Carpet shop in Kaleiçi. Photograph by Casey Russell. 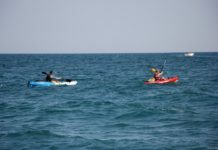 In conclusion, Antalya is somewhat of an elegant and superb city which shouldn’t be missed by locals and visitors alike. 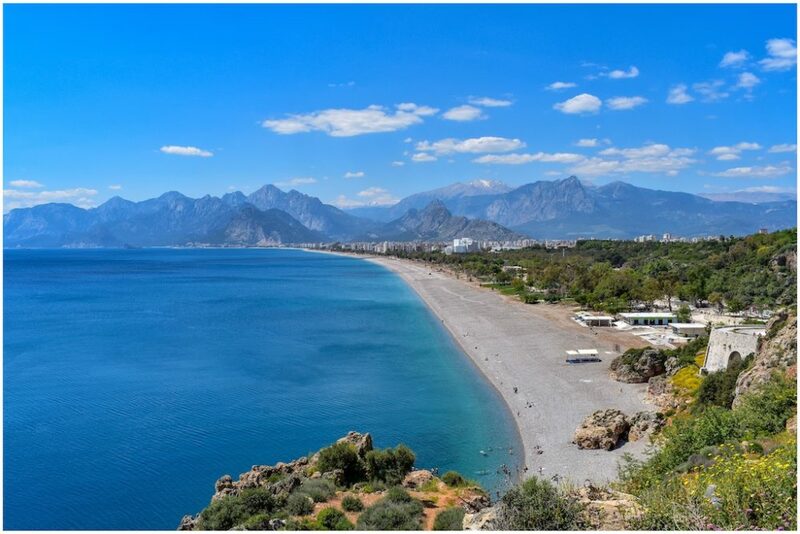 Once considered the gateway to the Turkish Rivera, Antalya is now a destination in its own right. The incredibly kept Kaleiçi is the centre piece of its elegance, and tie that with a modern, well connected city which has plenty on offer for you to see and do, you could say you have the seeds for a city of the future and certainly one well worth exploring. 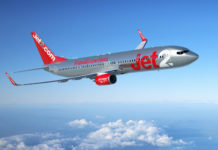 Antalya can be reached from Fethiye in under three-and-a-half hours. If you haven’t got a car, you can go by taxi or bus. It’s important to remember that there are two buses departing from Fethiye otogar. One that goes along the D-400 coast road and one that goes over the mountains on the D-350.